August 17 2011 . . .
A couple of days enjoying sand and surf at Myrtle Beach, then it's time to blow this pop stand. We dress Yaxley in his CCI cape and we're off to see the sights. But where to go today? Hmmm. Well, we've always enjoyed walking around the shops at Barefoot Landing, an outdoor shopping experience designed to remind you of an old fishing village. Docks, boardwalks, saltwater taffy and alligators. And it's just a skip and a jump down the road to get there. We walk around the Barefoot complex, checking out as many of the blessedly air-conditioned stores as we can. Yaxley is a rock star as we meet folk who ask about him and the Canine Companions for Independence program. 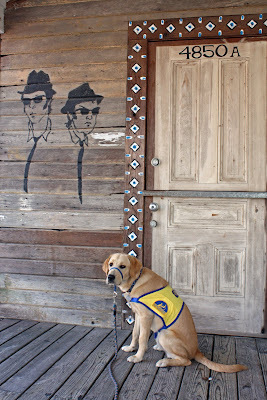 In all our road travels, we've found the Myrtle Beach community as one of the very few places where we'll encounter a challenge with service dogs in restaurants. So raising awareness of CCI is always time well spent there. 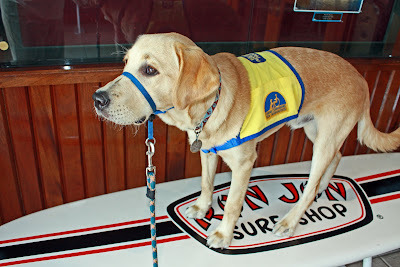 then why the heck do you think I'll be a surf dog? These signs were on every boardwalk at Barefoot Landing. "Careful! That cup of coffee you're about to drink may be hot!" This was a new and different stop for us. Wheels of Yesteryear is an impressive collection of restored classic and vintage automobiles. 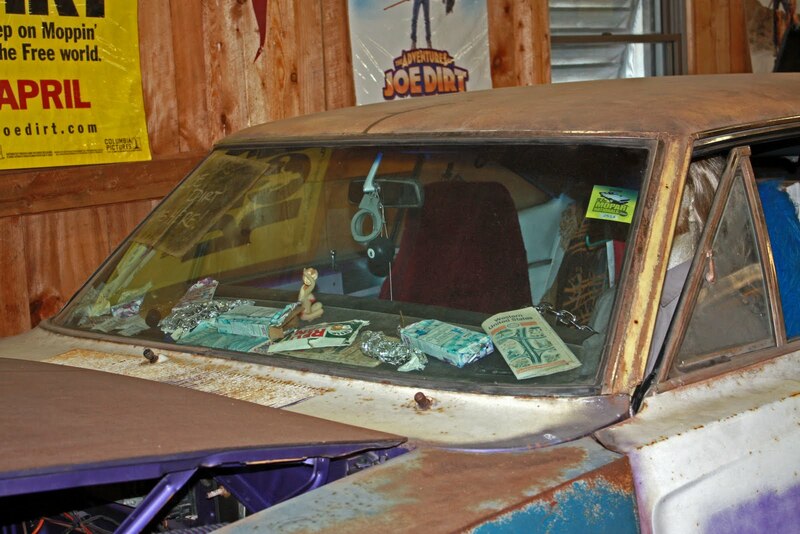 About fifty cars you can see up as up close and personal as your little V-8 heart desires. Being a dog person, this could have been a yawner for me. But no, as we pull into the parking lot, the marquee is shouting out at me with "SEE JOE DIRT'S CAR"
Holy Cow! Joe Dirt's 1969 Dodge Daytona?! From the soon-to-be-a-classic movie?! Well, why didn't you say so before? Sadly, I'm not kidding this time. It's a fun movie and if I'm flipping the channels around and discover Joe Dirt is on, then I'm heading for the microwave popcorn. It's true. Sorry you had to find this out about me. But it gets even worse. 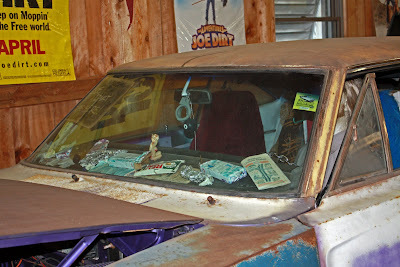 The Husband tells me that as I walked up to the car and looked inside, I actually said, Da-a-ang. I have no memory of this happening, but I'm inclined to believe him. Because he was laughing at me. What a treasure this place is. 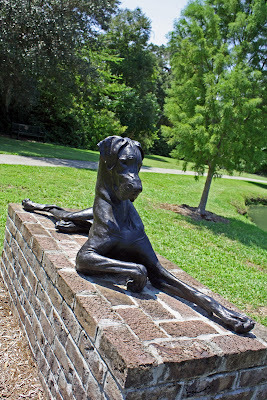 I just love Brookgreen Gardens, both an outdoor sculpture garden and nature preserve. So much history there. It was my reward for surviving the car museum, cuz marriage is all about the give and take, isn't it? Because of the nature preserve, we decide to leave Yaxley to relax in the air conditioned RV with the other dogs. As puppy raisers, we're asked to avoid taking the young pups to zoos and such. 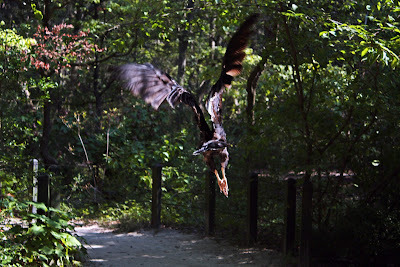 And you can get pretty darn close to some of the animals in the Low Country Zoo, especially in the aviaries. For example, we enter one particular aviary to greet a big flippin' turkey vulture skulking about the boardwalk like some kind of bridge troll. Huh. So, do we keep walking and hope he doesn't go all medieval on us? Or back away slowly to the double door exit? Never one to shy away from a really bad decision, I went for Option C, which was to raise the camera to get a close-up shot of his ugly mug. Turns out, turkey vultures are camera shy. Well, who knew? Put that little nugget in your field guide, Audubon. That's right. Fly away, tough guy. Anyway, Brookgreen's sculpture garden is truly a one of kind experience. As my usual style, I took a gadzillion and two photos. But to keep in the theme of all things canine, here I will share my shots of Louise Peterson's Bella and the Bug. 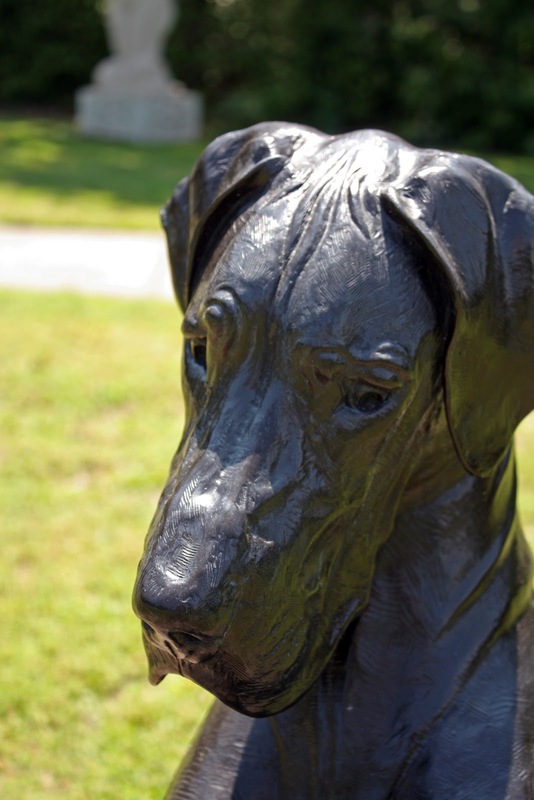 The sculptress created this image after watching her Great Dane concentrate on a fly crawling on a wall. I think this lady knows her dogs; she's absolutely captured the spirit of the moment. We take a break from walking around and rest on a bench under a shady tree. Rustling above reveals a squirrel busy at some kind of urgent tree rat business. Ah, a fox squirrel. We don't have these fancy critters back home. Hoping to get a nice clear shot of the fuzzy tailed rodent, I get closer and closer until . . . I say to the Husband, If this thing jumps from the tree and goes all militant on my head, you'll save me, right? The Husband, still back on the park bench, is looking straight ahead as he takes a sip of his Sierra Mist. He says in reply to me Sure, I got your back. Right. Well, rodent, I say. It looks like it's between you and me. Now just hold still a sec, willya. The Husband and I joke about folk who come back from a vacation at some exotic locale only to talk in grisly detail about the what they had to eat on the trip and what the best restaurants were. We say it's a sign that you're getting old. And I suppose it's possible that we could be creeping into that distinction as one of us had a milestone birthday during this vacation week. To maintain dignity, I won't disclose which of us it was. I'll only say that I'm the younger one and leave you to do ponder on it. All right, my mateys! It's Shrimp Night! The kid called to check on us and asked what our big plans were for the night. Why, it's Shrimp Night!, I say excitedly. O-o-o-o-kay, is the reply. Hey, ever since we saw the sign in Pirateland's parking lot that Hog Heaven BBQ was showing up, we've been looking forward to this dinner. 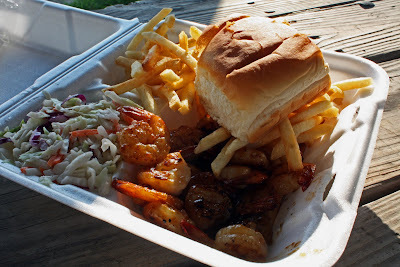 With the sound of the waves crashing and the ocean breeze blowing gently through our campsite, we settle down at the picnic table to nosh upon some barbecued crustacean goodness. 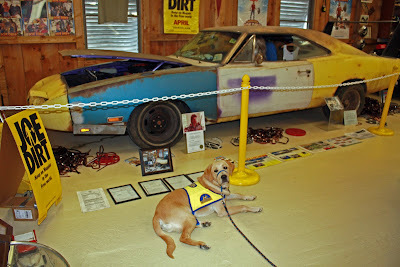 Now this is what I call a (stop that barking in there, dogs!) vacation. 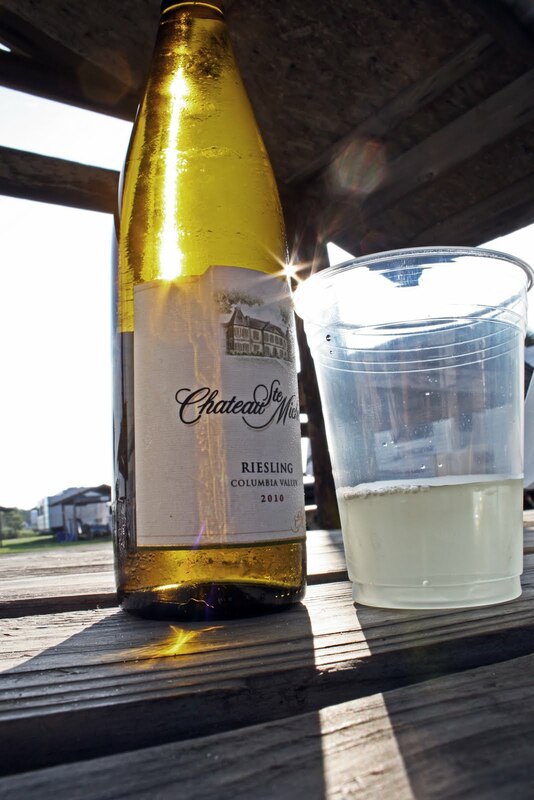 Some white wine in a plastic cup is the icing on the cake, so to speak. A lovely ending to a busy day.